Editors note: This article is a little dated (it was written in 2007), so you can trust that Colin’s equipment has evolved a bit from when this was written. The article may no longer reflect Colin’s recommendations, so keep that in mind. We still think there are things to learn from it, so we’ll keep the around as long as that is true. For better or worse, climbing is an extremely gear-intensive activity, and alpinism is the most gear-intensive type of climbing. 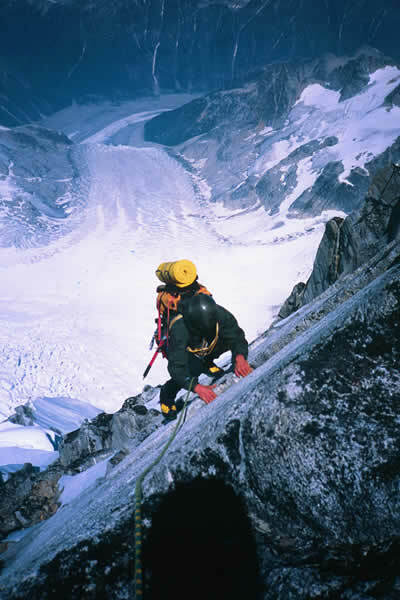 Alpine climbing requires equipment from all the other, simpler forms of climbing: rock climbing, ice climbing, aid climbing, and mountaineering. And because of the uniquely remote and demanding settings in which alpine climbing takes place, the choice of the right equipment is more critical to success than any other type of climbing. If materialism is offensive then you’ll be much happier bouldering. Colin Haley on the second ascent of The Waddington Traverse. Photo © Mark Bunker. This article is intended to help guide you in equipment decisions for serious alpine climbs on big mountains. I have written it with the assumption that you already have a large knowledge of climbing equipment in general, and that you already have a significant amount of alpine climbing experience. The article is far from exhaustive, and would be four times as long if I attempted to cover all types of equipment – the types I have chosen to write about are the ones in which I think you are most likely to learn something new. This article is for people who have already cut their teeth on local peaks and are planning to attempt bigger objectives: winter ascents in the lower-48, the Alaska Range, The BC Coast Range, the Himalaya, the Andes, etc. In any discussion of alpine climbing equipment, one theme is always present: the balance between weight and functionality. We try to be as prepared as possible for extreme terrain and extreme conditions while keeping the weight of our packs as low as possible. There is no definitive answer as to what equipment is the absolute best for any application, and I’m sure some people would disagree with many of my choices. Some of these ideas I learned from other climbers and some are conclusions I made myself from large amounts of time spent in the mountains. Since finally getting my driver’s license at 16, a large portion of my life has been spent in The BC Coast Range, The Canadian Rockies, The Alaska Range, the Sierra Nevada, Bolivia, Peru, Patagonia, Pakistan, the Alps, and mostly my home range, The Cascades. Many of the recommendations I make in this article ARE NOT CONSIDERED SAFE by some climbers, and are certainly not approved by the UIAA. I assume that you are smart enough to make your own judgment calls, and will be conscious of the risks associated with some of these deviations from the norm.